My 2016 Triumph Tiger 800 XRx has been a reliable machine both on the street and off-road. The Tiger came with Metzeler Tourance Next (90% road/10% off-road) tires which I promptly swapped for a set of Mitas E-07 Dakar Dual Sport/Adventure bike 50/50 tires to explore more adventurous terrain. But then I had a summer of mostly pavement riding ahead of me, so I decided to try the TerraForce tires. Mitas (pronounced Me-tass, think “Meet us”) has been around for a while as a maker of agricultural tires and is now becoming popular for Adventure (ADV) bikes. Note: Since I have not tried the most well-known players on the ADV/DS tire spectrum, I cannot make a direct comparison. So, the review is of my impressions of this tire and how it compares to the Metzeler. The Metzeler Tourance Next tires allowed peg feeler grinding. The OEM Metzeler Tourance Next (90% road/10% off-road) tires were fine on the street, but felt numb. This became even more apparent during a track day where the Tourance tires could not communicate well enough to instill much confidence. Grip was good though; I managed to corner hard enough to mangle both of the Tiger’s footpeg feelers. One thing that was a big negative was the crazy handling these tires gave after about 3,000 miles. The flat spot on the rear wasn’t terrible to look at, but this caused the bike to fall in terribly when initiating lean. And I had to put pressure on the upper handlebar to keep the bike from continuing to fall into the turn (oversteer) more than I wanted. I don’t recall the Tourances dong this when new. I rarely toss a set of tires that still have life in them, but away they went. I’ve read that lots of people like the Tourance Next, but this sucked. The first impression I had of the TerraForce was the increase in vibration. It seems that the very open sipes create as much or more vibration as the 50/50 E-07s. The tires handled fine. Considering how poor the worn Metzelers handled, it was no surprise the bike felt worlds better. The bike felt neutral, unlike the oversteering the worn Metzelers produced. Tire “feel” is a big contributor to rider confidence and the TerraForce delivers reasonably well at street speeds. However, push hard and the tires go numb. I don’t get a good sense that the tires are hooking up the way a 100% street tire does, and nothing like a supersport tire. But, that’s no surprise since the intended job of the TerraForce is to endure sharp gravel and the occasional impact with a log or rock. This requires a measure of carcass stiffness as well as a harder compound for both pavement and gravel endurance. I took the Tiger to the racetrack for three days. The first two days were dry and sunny. I was instructing in the novice group so I was more or less rolling around, not getting much heat into the tires. And little heat kept the tires numb and made me apprehensive about pushing harder. Bummer. The second day was also warm and dry. 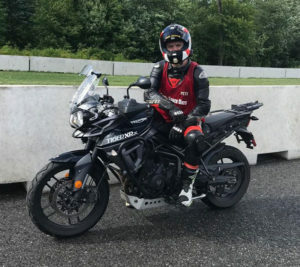 One of my other instructors needed to borrow a bike to work with his assigned group at the Non-Sportbike Track training Day, so I lent him the Tiger. At lunch I asked Pete what he thought of the bike. He said it did well as a street bike and was better tn he expected for a tall ADV machine. Cool. Pete, poised to put the TerraForce to the test. But, he added that he had gotten his knee down in several corners! Whaaaa? Here I was thinking the TerraForce tires were a significant limiting factor for going quick and Pete goes and drags his knees …on my bike! For perspective, Pete is one fast expert racer who regularly challenges for the win on his SV650 at Loudon. But, I couldn’t let that stand, so I reclaimed the Tiger and headed out to see how the heck he did this. Sure enough, the tires had decent feel. This obviously came from the heat Pete put into the carcass. Knowing that Pete pushed to knee-dragging lean angles gave me confidence to push harder and harder until I too got a knee down in a few corners. I had to hang off like a carnival monkey on the tall Tiger, but I did it. Even more important was the fun factor. The tires gripped tenaciously, making this the most fun session I had all weekend. What I learned is that if you get the tires nice and hot, they transform into a decent sporty tire. Caveat…you will not likely get the tires (or any tires) this hot at sane street speeds. But, as a street tire, the TerraForce gives plenty of grip, even if they don’t give great feel when cornering. Zipping around in the rain on a wet racetrack. The third track day was wet and cooler. The forecast was for rain on this day, so I brought the Tiger as my rain bike, leaving my Street Triple track bike for the dry sessions. 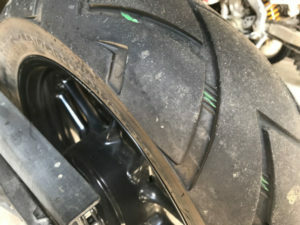 I know that street tires are a better choice than supersport race tires because they warm up faster and the rubber compound has more silica for better wet grip. And yes, I felt confident riding in the rain to a point where I was able to ride at a very entertaining pace. It took a few laps to get some confidence, but once some heat was generated, I was good to go. See the video below. The TerraForce isn’t great in the mud. After replacing the 50/50 E-07s with the 90/10 Terraforce, I wasn’t sure whether off-road performance would hold me back. It turns out that the 90/10s handle the rocky terrain just fine. As a matter of fact, they gave me zero problems when climbing a somewhat steep hill with some large ledge rocks. Mud is another matter. I was with a student in the unmaintained forest roads where I conduct the Adventure/Dual-Sport bike courses when I ended up in a decent mud hole. With some momentum, I was able to get through the muck, but the tires couldn’t gain any traction and spun mud all over. If your riding includes the occasional off-road adventure, then I wouldn’t hesitate with the Terraforce. Just know the limits. Mitas TerraForce Rear at about 5,000 miles. Notice the “cooling ribs” and zero chicken strips. My first set of TerraForce tires had about 5,000 miles on them before I had a puncture in the rear tire. I could have plugged the hole, but decided instead to get a new set because I was heading on a long trip down the Blue Ridge Parkway and didn’t want any trouble. In my estimation, the tires had about 4,000 miles left in them. Do the math and I bet you can get a solid 10k out of the rear and perhaps 10k from the front. Your results may vary. The front tire at about 5,000 miles. The tread blocks wear a bit unevenly. However, the large blocks seem to wear unevenly in the front. Not bad, but still this could be the determining factor in replacing the tires and not tread depth. See photos. As I mentioned earlier, these grooves tend to cause vibration and some noise and that the big blocks tend to wear unevenly. One unique feature of the TerraForce (and the Mitas SportForce) is the little cooling ribs at the base of the open grooves. The plugged puncture in the thin part of the carcass. Wide grooves make the tire vulnerable. The one thing to consider is having such open grooves makes the tire vulnerable to punctures. I had a rear flat while with street students, becasue a sharp stone penetrated the thinner part of the carcass inside the groove where the rubber is thinner. The rock was the size of a pea…small enough to get inside the groove, but big enough to puncture. Keep this in mind if you ride a lot on gravel roads with small stones. See the chart for available sizes. The TerraForce are a great 90/10 tire that will likely suit your needs just fine for pavement and some off-road. Click this if you want to visit the Mitas website. If you plan to buy the TerraForce or any other product, check with Twisted Throttle. Please click the link or the image then type “mitas” in the search field. This will send you to the twisted Website and any purchases you make help support this blog. BIG Thanks. 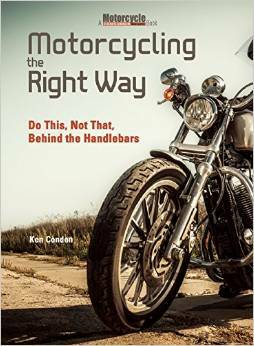 Twisted Throttle helps support this blog. They also have quality luggage & racks, riding gear, electronics, auxiliary lighting, bike protection, and much more. Happy shopping!